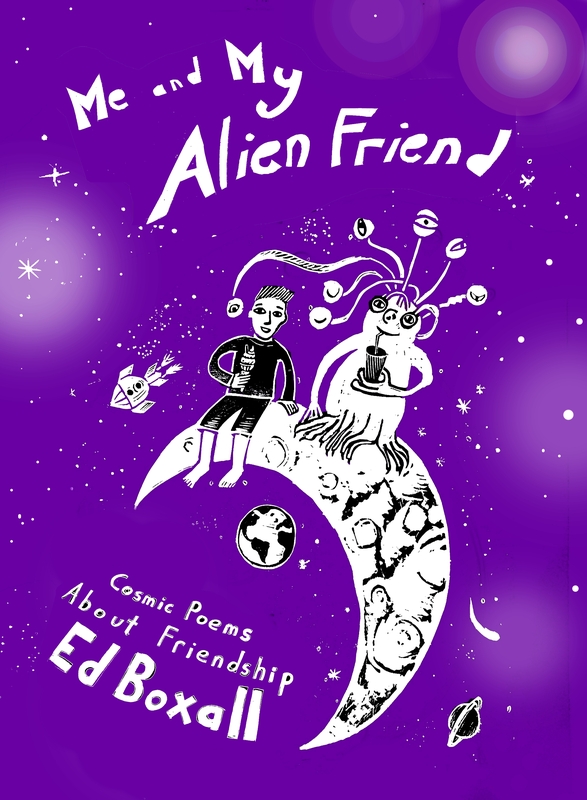 My full length collection of children’s poetry Me and My Alien Friend: Cosmic Poems about Friendship is published by Troika Books in September 2018. I’ve both written and illustrated the collection. Troika poetry books are lovely productions. They are bigger than most poetry books (165 x 225 mm), printed on strong bright white paper and richly illustrated on every page. The book is all about the the big wide universe of friendship. There’s lots about the every day ups and downs of childhood friendships but it gets pretty cosmic too! There’s a child who kicks the sun like a football to cheer his friend up; a child who feels a whole forest is his friend; a friendly dragon who is the colours of the sunset; and a child who builds a tree house in a jungle and makes friends with the animals. There’s a touch of sadness at times- one of my favourites is a poem about a lonely polar bear who is only visible to one child. In the title poem a child sits on the moon with his 38 toed alien friend, looking at our world from a peaceful distance: observing, thinking, and dreaming…a bit like poets do. The illustrations of the child and his alien-friend recur throughout the book. There’s also a lot of laughs in the poems. There’s the story of Jimmy The Woodlouse, a poem about a child who is friends with a scab and a poem about getting the giggles at the worst moment possible! I’ve made the illustrations just as important as the poems- there are lots of magical full page pictures packed with interesting detail. It’s a truly cosmic book of poems about some amazing friendships. Perfect for children aged 6 to 12 but there’s lots that younger children, and grown ups, will enjoy too.